Pay attention, folks! Are you looking for the perfect book for a preschool child this holiday season? 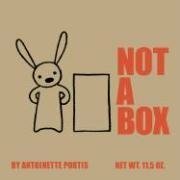 Then I've got the book for you: Antoinette Portis' Not A Box. It will be released on December 1. As you can tell from the cover, Not A Box features simple, iconic line drawings of a rabbit and a box. Portis dedicates the book "to children everywhere sitting in cardboard boxes" and celebrates the magic a large box brings to a child. The book opens with a question: "Why are you sitting in a box?" The young rabbit replies, offended, "it's not a box." And the illustration shows him sitting in a racecar. And, so on. Rabbit climbs a mountain, fights a fire, wears a robot costume. His box is anything, but "it's NOT NOT NOT NOT a box!" What it is, though, is highly, highly, highly, highly recommended. Not A Box and Learning To Fly are my two favorite picture books of 2006.